We will meet on Saturdays, from September to June, from 10.00-12.00 am. Parents with children can play with us for free during adaptation exercises. The exserscises will be taken in English and Polish! During this time we will helpchildren to adapt to the new situation. The children will do sport, music and art helping to build a special relationship between children, parents and teachers. Thank to ” FUN AND PLAY SATURDAY” will adapt more easily when its time to start kindergarten. 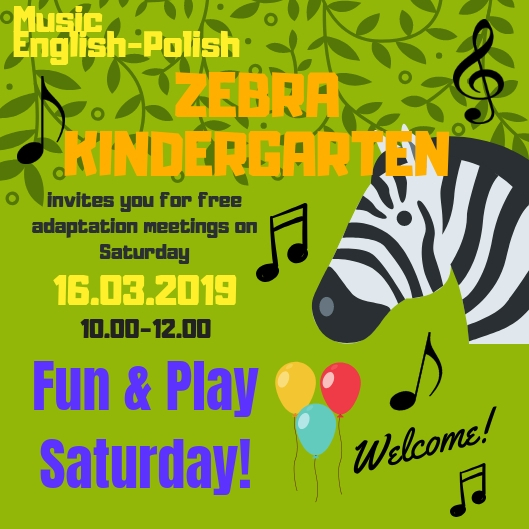 8th od April (at 10am-12 noon)- we will take children to the colorful world of weather.We will show children how at rainbow is made, the children will learn the colors of the rainbow, they will draw and pain rainbow to put in the playground. 12th and 19th of May (at 10am-12 noon)- we welcome our new kids to the healthy, fruits meeting„Food and Fitness” and Colors around us”. On this day kids with the parents will learn fruits and vegetables in English, we will sing a “Food and Fitness Song”. During the reading “Healthy habity book” we will discuss healthy eating habits. We will talk about favorite dairy products, we will do “Milk cow art” and with parents we will learn how to milk a cow! We will answer the question : are the grains healthy? We will introduce Polish healthy grains. Each child will make their own colourful fruit salad and with a blender parents will make juice! At the end of the meeting we will invite children to the playground, where we will do “Funny Sunny Gym”! Welcome! 9th and 16th of June (at 10am-12 noon)- we are inviting our new kids to play togheter in our countryside backyard! We welcome you with Hello song , after that we are changing theame. Now the children will play farm animals and we learn animal names in English, we will learn “Old Mcdonald”, we will recite “On the Farm”and learn about farm animals. We will create a happy climate playing in the countryside. Togheter with parents we will make hats in the desighn of cows and sheep. On the playground happy gymnastic country animals will be waiting for us! All children need only bring the good energy and mood! We welcome you to our kindergarten!